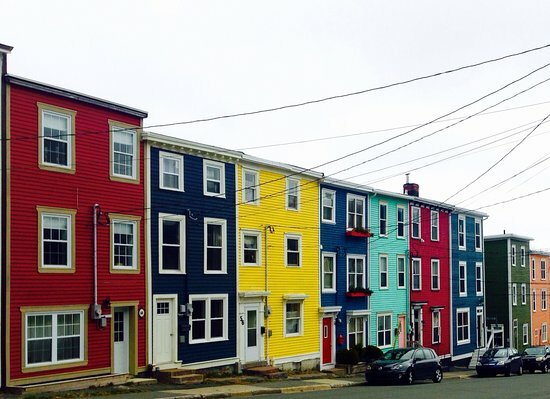 On my way to lunch and catch up with a friend, something caught my attention—with Hamilton still fresh in my memory, the kaleidoscopic ‘Jelly Bean’ houses of downtown St. John’s juxtaposed the Ontarian brick, where the spectrum ranges from ochre to burnt-sienna. The sensation of fresh, salty air was no longer a mirage. Those familiar with our uninhibited style quickly took up the customary heckling; the uninitiated merely shook their heads. Re-immersing myself in the Choss Boys dynamic, if only for three hours, was invigorating. In September, I ordered Training for the New Alpinism (TNA). The book promises alpine glory for eager neophytes like me. However, many pivotal workouts in TNA require terrain with marked vertical relief. Tricky tricky in Ontario flatland... Thus, my plan for a ski-touring trip was conceived. Seamus immediately and enthusiastically agreed. The island of Newfoundland is, in at least one sense, a microcosm of Canada: travelling west across the country, the snow cover and topography increase dramatically upon reaching the foothills of the Rockies; likewise, when driving from East to West across Newfoundland the snow is sparse and the hills soft until the Long Range Mountains appear on the horizon. The 'Blomidons,' a section of the Long Range Mountains. However, Newfoundland’s ‘mountains’ are smaller than the Rockies by an order of magnitude. Even the trees are bizarrely stunted—elders barely surpass the height of a proud Homo sapien. But what these hills lack in stature, they surpass in ferocity. Stalwart krummholz trees (known as ‘tuckamore’ or ‘the tuck’ in Newfoundland) defy relentless winds and emaciated soil. Tempests sprout up from the impetuous North Atlantic Ocean and distend over the land with fury. Moisture-laden gails adorn the craggy highlands with rime, and persistent gusts wither the snowpack to an icy crust. Andrew May, captured in his natural habitat. We connected with Andrew May, a seasoned backcountry explorer and Seamus’ go-to “West Coast guy.” Although he has intermittently pursued nearly every outdoor sport you can imagine, skiing predominated. Andrew grew up in Corner Brook, and is more familiar with the Long Range Mountains than anyone. Who better to unveil Newfoundland’s best kept secrets? We left from his bucolic A-frame house at 9AM, taking two cars so we could ferry from the end back to the start of our route. Skiing began at Coppermine trailhead. Skins underfoot, we mounted our assault on the 500 vertical-meter climb and quickly disappeared into a tuckamore tangle. A sweeping vista of the Bay of Islands greeted us upon reaching the highlands—as did an onslaught of wind. Following Andrew’s GPS, we traversed 3 km of rolling tundra to arrive at a rocky bluff overlooking the Humber River delta—a breathtaking landscape pied with cumulus shadows. The next leg of our journey took us across 4 km of featureless barrens, fighting against a 50 km/h headwind. Andrew stoically took the lead, with Seamus and I following single-file in his draft. Scrutinizing contour lines on the GPS, we decided to traverse the South rim of the brook, and aim for a bulging rib at the confluence of two canyons. We had to carefully negotiate slopes of wind-rippled blue ice and hidden cornices, but we arrived at the lip of the rib uneventfully. Seamus was first to brave the steep terrain, followed shortly after by me, then Andrew. This glorious but fleeting descent was merely the halfway point. After another 11 km of blistering travel (literally, for me), we completed the proud 22.5 km loop in 8 hours. When I finally pulled off my sock back at our cabin, I could see the resplendent glow of the fire reflected in a subcutaneous reservoir on my left foot. Satisfied with the resurgence of adventure in my life, I basked in front of the fire and cracked a dark, malty beer. Seamus and I cheersed. The guise of ‘training’ I had allowed myself to place on this trip vanished after a second night of beer-infused revelry. This was a full-on vacation. Seamus and I followed the ski tour with two days of lift-accessed adventure skiing. Marble Mountain, the local ski hill, is the largest in the maritimes. Many of its sultry groomed trails are bifurcated by swathes of impenetrable tuckamore trees and alder bushes. These thickets invite only the deranged: Seamus and me. It quickly became our mission to descend the most tangled, steep, and by all accounts un-skiable slopes on the mountain. Our progress was made one turn at a time, each preceded by several minutes of careful scouting, pointing, and squinting through the copse. I was responsible for the culmination of this stupidity. From the chairlift, I glimpsed some slightly thinner trees that offered hope of linked turns, and untouched powder. To access it we took a chance on a steep gully that seemed directed toward exactly the right place. It was less scary than awkward to descend the waterfall. If I had a rope I would have rappelled. I finally worked up the courage to straight-line the ice and punch a hard carve in the rubble at the bottom. It worked, barely. Having returned shortly thereafter to St. John’s, my final two days in Newfoundland were spent in the comfort of family and friends. I enjoyed home-cooked meals, lively conversation, and renewed stoke from a meeting with Erik about our upcoming goals. All the while I had been certain the trip home was for training—an opportunity to cram a winter’s worth of alpine training into a single week. But this was a delusion. Really, I needed a break from the rigid framework of academic life in Hamilton, and to restore some motivation in the only way I know how—with a stiff sea breeze and the company of fellow Islanders. Glad you had a good time. Good thing I wasn't around when you decided to chance the gully! A wonderful tale, lad. A wonderful tale.